With his hand wedged firmly in a crack of the sheer granite face of El Capitan, Alex Honnold looks up and scans his route as he doggedly continues his death-defying ascent of the iconic rock formation with no safety ropes to save him in case of calamity. Hanging just meters above Honnold is fellow climber and filmmaker Jimmy Chin, who must focus on his work composing video and still images, knowing he’s capturing arguably the greatest athletic feat in history, or quite possibly his friend’s death. Choosing to be on that rock face, peering through his camera’s viewfinder while knowing all that could go wrong was a decision Chin and his wife, co-director Elizabeth Chai Vasarhelyi, had to weigh carefully before agreeing to film Honnold’s quest to become the first climber to ascend El Cap without safety ropes, a climbing style known as free soloing. “It’s hard not to imagine your friend falling through the frame to his death,” Chin says in his upcoming film “Free Solo,” which documents Honnold’s harrowing feat. "Free Solo" director Jimmy Chin, right, and his wife and co-director Elizabeth Chai Vasarhelyi had to consider every scenario, including death, before agreeing to film Alex Honnold's harrowing climb of El Capitan. 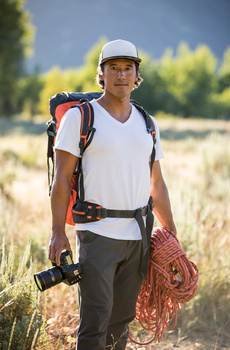 Chin himself is an internationally-known, world-class mountaineer, cinematographer, and photographer. 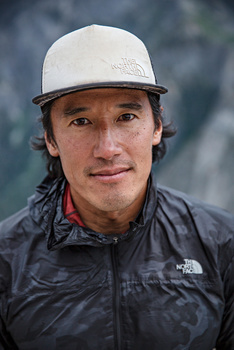 A long-time North Face athlete, Chin was part of the three-man team that became the first group to summit Meru Peak along the Shark’s Fin route, a nearly 22,000-foot Himalayan ascent that was the subject of Chin’s 2015 documentary film “Meru.” He’s also the only American to ever ski off the summit of Mount Everest. “Free Solo,” which opens September 28 in select cities nationwide, is an intense study of Honnold, the man who completed what The New York Times described as “one of the great athletic feats of any kind, ever.” More than that, though, it’s the result of Honnold, Chin and the crew’s dedication, determination, and ability to master their fear. Honnold’s mastery is what ultimately led Chin to take on the project. “Alex can function and execute perfectly at an extraordinarily high technical and world-class level,” Chin said. "I mean, we’re talking about the top NBA players, an Olympic gold medal gymnast, the best martial artists in the world — he can maintain that level of performance in the face of instant and certain death for very long periods of time. I knew he was an anomaly among anomalies, and so he’s an interesting character study. Alex Honnold considers the challenge he faces in free soloing El Capitan's famed Freerider route. Documenting Honnold’s perilous climb up the route known as “Freerider” posed many challenges beyond the simple logistics of shooting while clinging to the side of a 3,200-foot sheer granite wall. 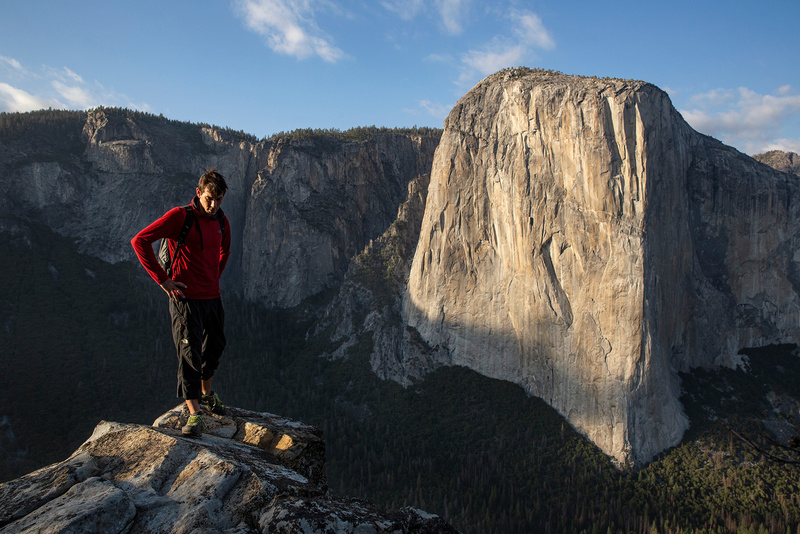 As Honnold prepared for the climb, the life or death stakes made shooting the nearly two-year production physically, mentally, and emotionally exhausting for Chin and the rest of the crew, who were careful to insulate Honnold from their own anxiety. They worried their emotions could be projected onto Honnold, distracting him from the ultimate goal. The shoot wasn’t just complex, it was grueling. The crew spent more than 30 days over the course of two years on the face of El Capitan, as Honnold planned and practiced his route, memorizing the complex moves necessary to complete the climb when the ropes came off. Chin said spending so much time on the granite face was a constant battle to maintain absolute focus. Statistically, he said, the chances of an accident grew with every day spent on the mountain. Chin had to stay on top of it while pulling triple-duty as director, cinematographer, and photographer. In addition to his filmmaking responsibilities, Chin also was tasked with shooting on assignment for National Geographic, further complicating matters as he often had to decide whether he should be filming or shooting stills. To make it easier, his crew rigged a DSLR atop his video camera so he could more easily switch between the two. “Sometimes those goals were in conflict,” he said. "Maybe you’re filming and you want to take a photo but you can’t interrupt the scene or someone is filming in the spot where you want to shoot. On top of that stress was the ever-present need to manage the risk of the climb. To ensure they didn’t miss anything, Chin had four cameramen on the wall, including himself, capturing the action mostly from above Honnold. Another cinematographer was stationed on the ground with a long lens and, at one particularly treacherous point in the route known as “The Crux,” Chin stationed a pair of remote cameras. 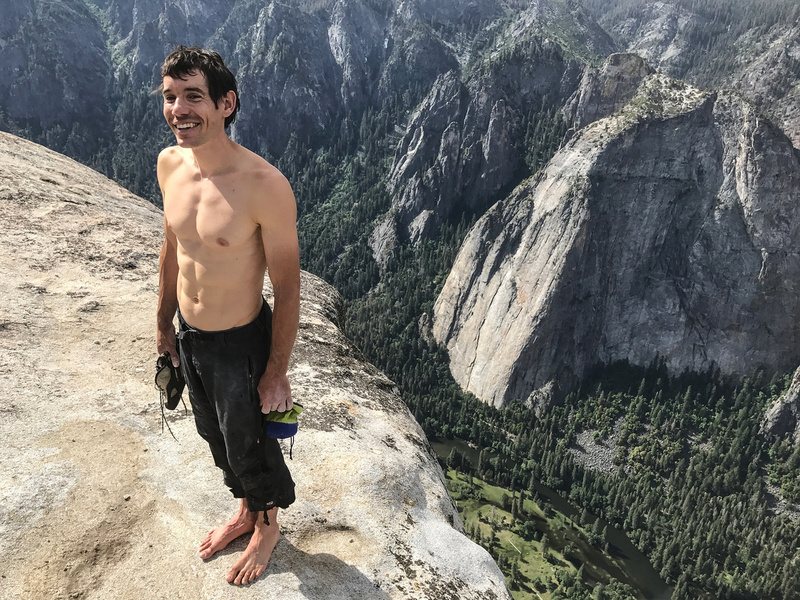 Honnold did not want anybody shooting there because he didn’t want to fall in front of a friend, Chin said. 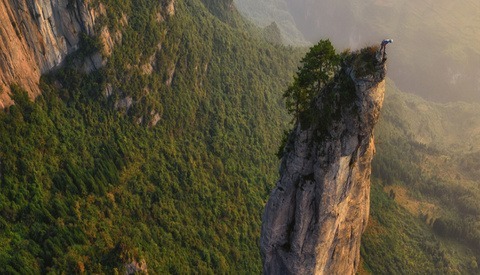 Chin assembled a crew comprised of world-class photographers andcinematographers who are also world-class rock climbers. Chin needed climbers who could match the breakneck pace Honnold set moving up the side of the formation. 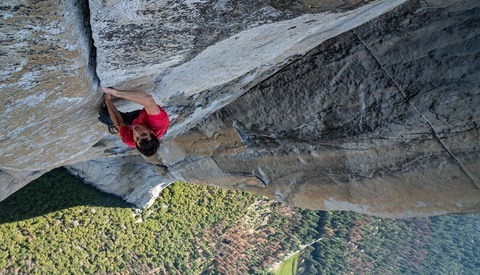 While Yosemite National Park recommends climbers take four days to ascend the Freerider route, it took Honnold a mere four hours to complete the climb, forcing the filmmakers to move quickly to stay in position to capture the action. “He’s the fastest climber in the world, so we had to have a team that could keep up with him,” Chin said. Assembling that crew was a critical part of the filmmaking process, Chin said. The film production would only be as good as its weakest link, and any mistake could be fatal. Chin noted that something as simple as dropping a lens cap could result in Honnold’s death. The crew had to be perfect, day in and day out, and Chin had to make sure every single member could withstand the rigors of the production. Chin relied on methods he’s cultivated over a 20-year climbing and filmmaking career to put together a multitalented, dedicated and fastidious crew that he knew he could absolutely trust with Honnold’s life. “Basically any high stakes shoot where it’s financially high stakes, or a big client, or a big shoot, I only work with people whom I have worked with a lot or who have been vetted very, very carefully,” he said. “There’s no room for people who won’t be performing at an extremely high level. The stakes are too high. [Selecting] the crew is a critical part of the process for the work I want to produce, and it’s all about the people I choose. Free climber Alex Honnold stands tall atop El Capitan after complete the first free solo ascent of the Freerider route. When the day finally came for Honnold to shed the ropes and make his ascent, Chin and the crew had to get into a headspace to perform their functions flawlessly and stay out of Honnold’s way. The mounting pressure had built for two years and, as Honnold finally grasped the top of El Capitan’s sheer wall and pulled himself up to the summit, Chin said the crew finally got a well-earned reprieve from the emotional burden they had been carrying. Free Solo is in selected cinemas September 28, 2018. Click here to find a theater near you. I forgot that climb got filmed...this looks badass! Can't wait for the "The Dawn Wall" too! Life is too precious for this crap. Send a drone. The climb itself was amazing enough, but when you hear about what it took to film it, it's really mind-blowing they were able to document it so well. 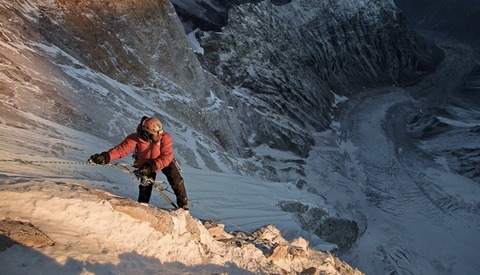 Great work by Jimmy Chin and crew.